Offspinner Johan Botha has been named captain of South Africa's Twenty20 team, replacing Graeme Smith, who stood down earlier this week. Smith remains captain of the Test side and will continue to captain the one-day side until the end of the World Cup. "Johan was the unanimous choice of the Board and we have every confidence that he will do an excellent job leading up to the next edition of the ICC World Twenty20 in 2012," Cricket South Africa CEO Gerald Majola said. Botha stood in for Smith during the limited-overs leg of South Africa's tour of Australia in 2009, leading the team to a series win. That experience appears to have convinced CSA he is the right man for the job. "Johan has an excellent record as a leader," selection convener Andrew Hudson said. "He was an inspirational captain when he stood in for Smith in the ODI series victory in Australia in 2009. His appointment is part of the process of refreshing our Pro20 squad and also deciding whether to follow the route of having different captains for different formats of the game." Botha said he had enjoyed his earlier taste of the captaincy was hopeful he would do well enough so that when the time came, he would be considered for the one-day captaincy as well. 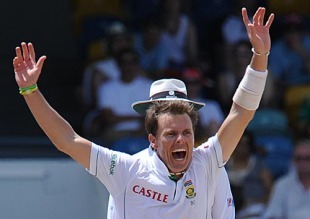 "I really enjoyed the captaincy when I stood in for Graeme before, and I am proud to be offered the job now. I am looking forward to working with such a special team. I will have three Pro20 games before the World Cup and hopefully we can play some good cricket during that period. "As far as the 50 overs captaincy is concerned, I will have to see how my own form goes and how the team performs. If everything goes according to plan I would like to think I have a chance of captaining in the 50 overs format as well when Graeme stands down at the end of the World Cup." Botha has played 21 Twenty20 internationals, taking 22 wickets at an average of 19.18 and scoring 113 runs at an average of 18.83.